The United Nations Security Council has agreed to exempt this week’s groundbreaking ceremony for inter-Korean road and railway projects from sanctions, reports said Tuesday, in another sign of the US softening its stance toward North Korea. Negotiations with the UNSC North Korea sanctions committee on the groundbreaking ceremony were completed Tuesday in New York, said Yonhap News Agency, citing an unnamed South Korean Foreign Ministry official. Earlier this month, the two Koreas agreed to hold a groundbreaking ceremony on Wednesday, as part of a joint effort to implement an agreement reached by their leaders at their third summit, held in Pyongyang in September. The ceremony is set to be held at Panmun Station in the North’s border town of Kaesong, with ranking officials from both Koreas and several foreign officials attending. Some of the materials needed for the event, such as stage equipment, were transported to the North around 8:30 a.m. through the western road connecting the Korean Peninsula, a separate media report said. Though the ceremony itself is not subjected to sanctions, such materials and the South Korean locomotive entering the North Korean region needed the waiver, observers said. The UN decision had been largely expected, with Seoul’s top nuclear envoy Lee Do-hoon saying that the planned event would be possible, after a working-group meeting with his US counterpart Stephen Biegun on Friday. Tuesday’s announcement was interpreted as final confirmation from the international community for the ceremony. South Korea’s Unification Minister Cho Myoung-gyon and Transport Minister Kim Hyun-mee, Ri Son-gwon, chairman of the North’s state agency in charge of inter-Korean ties, and Kim Yun-hyok, the North’s railway minister are expected to be among the senior officials attending the ceremony. Some 100 people from each Korea are planning to attend the event. The South Korean delegation will board the Kaesong-bound train at Seoul Station early Wednesday. Foreign officials, including Russian Deputy Minister of Transport Vladimir Tokarev, Hexiang Yan, deputy assistant at the Chinese Ministry of Railways, and Mongolian Minister of Road and Transport Development Yangug Sodbaatar, along with several foreign ambassadors to South Korea, will attend the groundbreaking ceremony, according to the South’s Ministry of Unification. Seoul earlier set aside around 700 million won ($622,800) for the event. 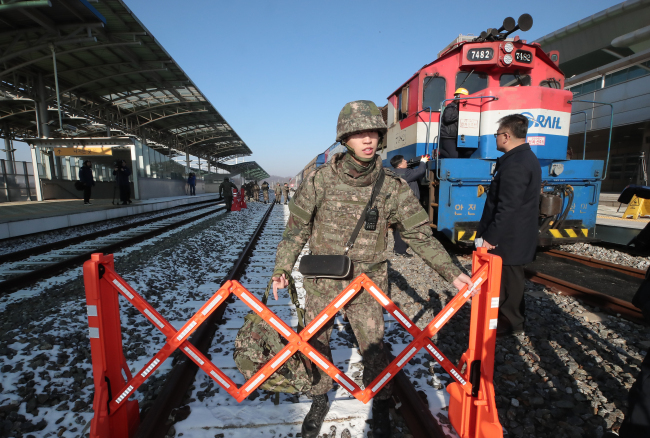 Though the ceremony is viewed as a step toward improved inter-Korean relations, the Seoul government has been stressing that it is merely a symbolic event embodying the two Koreas’ hopes to reconnect and modernize cross-border railways and highways, rather than an actual signal to start construction. President Moon Jae-in has said the launch of construction would need further discussions with the US and UNSC. The ceremony comes amid growing signs of the US’ friendly gestures toward North Korea, despite stalled denuclearization talks between Washington and Pyongyang. US President Donald Trump tweeted Monday that progress is being made on the issue of North Korea, after being briefed by Biegun, and that he looks forward to his second summit with North Korean leader Kim Jong-un. The briefing came after Biegun wrapped up his three-day trip to Seoul on Saturday.